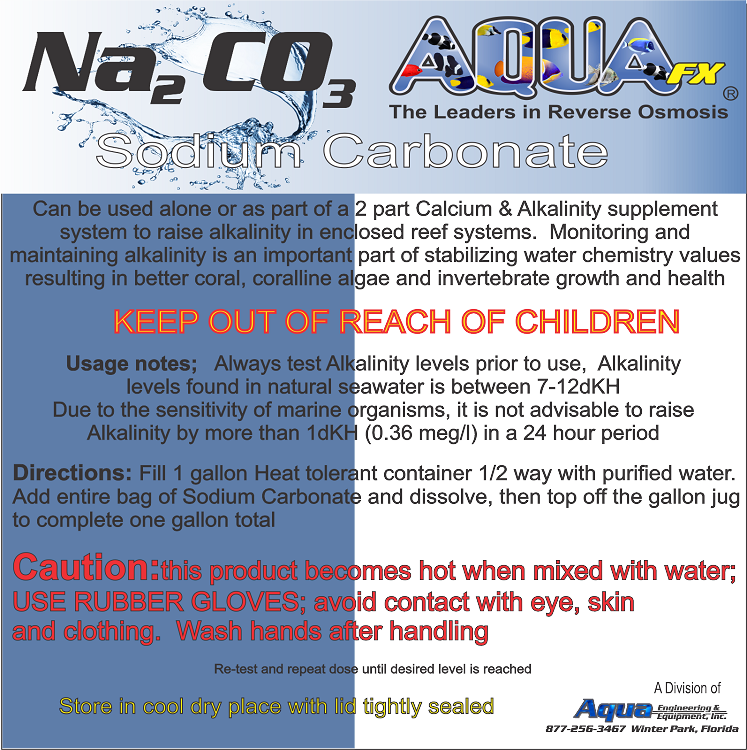 AquaFX Sodium Carbonate is perfect either by itself or as part of a Calcium and Alkalinity duo to maintain appropriate alkalinity levels in your reef system. Monitoring and confirming that alkalinity levels stay at an appropriate level will ensure better coral growth, Coralline algae, as well as, invertebrate growth and health. Natural Seawater is between 7-12 dKH. Always dose to a high flow area of the tank. Dose less than needed to measure the effect before adding the total amount. Product will release heat when mixed with water and become hot. Always wear gloves and eye protection when handling. Avoid any contact with eyes, skin and/or clothes - wash hands after handling. Store in a cool dry place, always keep package sealed while in storage. AquaFX Sodium Bi-Carbonate 1 Lb.